I've been busy this morning whipping up a delicious batch of these homemade candies to give to my kiddos' teachers tomorrow for Valentine's Day. After taste-testing a few of these myself (quality control!) I can say with absolute certainty that they are going to love them! This recipe is super easy to make. Only four ingredients! However, there is a lot of hands-on work with rolling and wrapping the candies, but it is so worth it. Everyone will love them! You can experiment with the flavoring. I used orange extract, which is just delicious, but peppermint, vanilla and raspberry would be so good, too. And trust me on this one, if you're planning to give any away, make a double batch! That way you'll have plenty for yourself! Cover the mixture with a second piece of wax paper and let the chocolate mixture set over night at room temperature; it will be stiff, but still flexible. Turn your candy out onto your work surface and cut the mixture (a pizza cutter works really well!) into whatever size sections you prefer. Then roll the pieces between your hands into little logs. Set the candies aside to firm up before wrapping, since the mixture warms up and softens as you handle it. 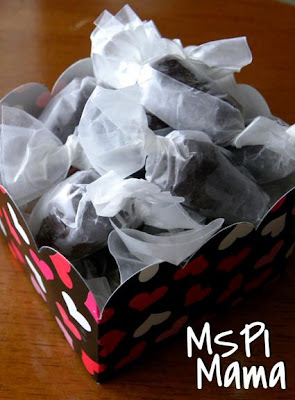 Roll each candy up in a square of wax paper. Twist ends to secure. Silly question...but if we want just the regular chocolate tootsie roll...then don't add the orange flavor? I would substitute vanilla for the orange extract.